Family businesses find themselves under severe innovative pressure due to the persistent digitalization inexorably disrupting traditional industrial value chains. Like all firms, family firms are forced to respond to disruptive threats by establishing innovative avenues for value creation, including new business models. As I have already emphasized in my previous Viewpoint, one of the major challenges in the face of digitalization is the accelerating pace of change. Despite the fact that in particular later-generation family firms are accustomed to recurring changes, the speed of change is becoming ever faster with digitalization. Therefore, it remains essential for family business decision makers to gain a full understanding of the nature and the possible impact of these changes to ensure their competitiveness. In contrast to many family businesses, startups seem to embody the nature of digitalization and especially its inherent cultural changes. They are characterized by lean, agile and flexible organizational structures, high customer centricity, and a corporate culture that can accept failure. It is this particular combination that allows startups to execute innovation at top speed. For example, most successful small tech companies favour experimentation over-elaboration, which means that a first prototype – the so-called Minimum Viable Product (MVP) – is introduced even before the final product has actually reached market readiness. In direct exchange with the customers, the MVP is then being tested and continuously improved in an iterative process. They do not follow the traditional long phases of research, testing and meticulously work in order to create the perfect solution – an approach typical for Germany’s mostly family-owned Mittelstand, internationally renowned for their “Made in Germany” high quality. Thus, family businesses are in desperate need of a paradigm shift in order to successfully drive their digital transformation and in my opinion, a viable approach is to establish and foster more cooperation with startups. However, the global startup landscape is very complex, not only in terms of its geographic dispersion – there are very many highly specified hubs – but also with regards to different industries and above all different technological fields, like the internet of things (IoT), artificial intelligence (AI), robotics and many more. It is therefore not surprising that it might be very complicated and confusing for family business owners to get a clear picture of what may actually be relevant for their businesses, how to find the right people to collaborate with and ultimately how to approach them. In addition, the recent startup boom has also coincided with the emergence of various ways of collaboration and startup support through new players in startup ecosystems, among others venture capital funds, incubators, accelerators, etc. In light of this, below I have looked at the most commonly used approaches of established companies to identify new pathways to innovation and growth. Corporate Venture Capital (CVC) targets more mature and later stage start-ups and is, therefore, an approach mostly taken by larger family firms due to the high cost and significant risks involved. Collaboration and cooperation is realized through joint venture agreements or acquisitions of equity stakes. Investors are given a seat on the board of directors and therefore can have a significant say in the startup’s strategic direction and in turn provide them with essential resources. Family business owners have the choice between establishing an internal CVC team or setting up their own external CVC vehicle. The latter is usually more efficient than in-house venturing because regular family firm employees are rarely familiar with the peculiarities of venture capital, comprising complex financing structures, gradual investments through minority interests, very high rates of failure and the inapplicability of traditional valuation methods. This is especially true in the context of digital business models, where traditional financial accounting models do not capture their major value creators. For example, Viessmann – a long-established German family business – launched its own venture capital fund called Vito Ventures, supporting promising startups on a global scale. Its investment focus lies on artificial intelligence and deep learning, e.g. in the fields of Industry 4.0 (i.e. the current trend of automation and data exchange in manufacturing technologies), big data, smart home technology, and industry. Incubators and accelerators constitute alternative options for family business owners. They are different from CVC as these engage with early-stage startups. However, although incubator and accelerator programmes clearly differ from one another with respect to their objectives and timeframes, the two terms are often mistakenly used interchangeably. Incubator: Incubator programmes primarily serve as (co-)working spaces created to support new ventures giving them access to necessary resources (e.g. financial and technical support) for an indefinite period of time. In addition, the incubator in form of the family business works alongside the startup teams, providing them with market expertise through professional mentoring, extensive global networks and administrative support. Because of their early-stage involvement, incubators can receive relatively large equity stakes, particularly in comparison to accelerators. These can be anywhere from twenty per cent or more and also include selecting and composing the founding teams. Therefore, incubation programmes serve as a great opportunity for established companies to develop innovative internal ideas from within their own organization. Employees are thereby given the chance to bring their own ideas to fruition in an open environment outside of the company’s organizational boundaries. This ultimately nurtures an overall corporate culture of innovation. Lab1886 is a successful example of incubation. Established by Daimler in 2016, its main objective is to drive the company’s digital transformation from inside out, by gathering innovative ideas from Daimler’s 280.000 employees and turning the most promising ones into new business models in a startup-like environment. Car2go or Moovel are only two of the many success stories stemming from these efforts. Accelerator: Similarly, accelerators support early-stage, growth-driven startups through education, mentorship and financing, but in contrast to incubators, are much more short-term oriented. Accelerators offer fast-paced and clearly structured programmes typically lasting for no more than three to four months. Moreover, in contrast to incubators, accelerators do not develop the venture ideas themselves, but source them externally. This allows for considerably smaller equity shares, usually remaining in the one-digit per cent range. The number of participants for accelerator programmes is also often very limited, which leads to an increased level of competitiveness. Most accelerator programmes culminate in demo days, where startup teams get the chance to pitch their ideas to (family business) investors. Following the previous example, Daimler also established an acceleration program called Startup-Autobahn in cooperation with the renowned accelerator Plug & Play. It is considered an innovation platform with the objective to moderate an in-depth and curated collaboration between the established industrial player, its partners and young tech companies. In this way, Daimler additionally aims to source innovative venture ideas from outside the organization. In conclusion, there are numerous options for family business owners to get access to innovation by cooperating with the startup world. Prior to entering any collaborative activities, family business decision makers should be aware of the various possibilities and their idiosyncrasies. Careful consideration should be given to all options, with a focus on finding the best fit and alignment with the overall family business strategy in order to achieve a long-term impact. It is crucial to determine a specific investment focus and to clearly define key technological areas needed to optimally guide the search for innovative ideas. By integrating the process into a transgenerational succession phase – like in the case of Viessmann – the digital savvy next generation of family business owners are often a supporting asset in navigating the startup jungle. An interesting new development is professionals who specialize in supporting family firms wishing to cooperate with start-ups. For instance, the Munich-based AlphaZirkel 21.0 connects family business owners with its vast network of international VCs, incubators, accelerators, company builders, innovation labs and also renowned technical universities as well as scientific institutions. In close collaboration with the key decision makers, AlphaZirkel 21.0 selects from an enormous pool of innovative ideas and startups in order to offer family firms customized solutions, which are subsequently accompanied in order to assure maximum value from cooperation. 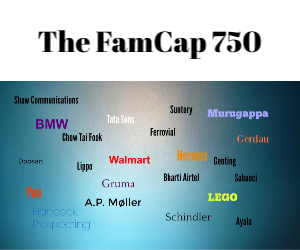 With this large array of possibilities to connect with the highly innovative startup world, all family business entrepreneurs need to do is get out there and take the first step towards a new generation of entrepreneurial spirit. Leopold holds a Master’s degree in management from the European Business School (EBS) in Oestrich-Winkel, Germany and is now PhD candidate at the Witten Institute for Family Business (WIFU). His doctoral thesis is on innovation in family businesses. Apart from theory, he also has insights into his own family’s fifth generation business which was founded in 1879.